ANN ARBOR, Mich. --- In what many analysts say is the boldest evangelistic move in modern day Adventist history, Generation of Youth for Christ (GYC) leaders have announced plans to send an army of young people to "infiltrate" the annual Coachella Valley Music and Arts Festival (commonly referred to as Coachella) in 2016. 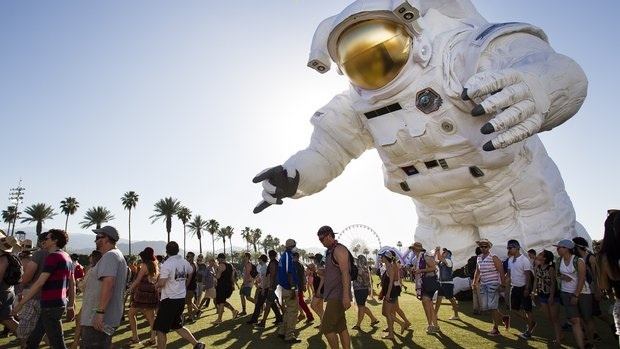 The festival held in Indio, Calif. draws an annual crowd of over half a million event goers. GYC organizers have capitalized on buzz around the currently ongoing 2015 Coachella festival, to generate excitement about next year's evangelist effort. "You can only get so far with inviting passersby to Revelation seminars," explained GYC spokesperson Wendy Pujic. "This new Coachella tactic is all about tapping into one of the most talked about yearly events in pop culture and letting our little lights shine." Plans are for a group of 100 GYC organizers and supporters to attend the event in 2016 with General Conference-issued glow sticks which will be built to look like the three flames in the Adventist Church's logo. The band of Adventist young people will split up among the various events and have promised to "go nuts" waving their glow sticks at each and every one of the after-dark performances. During daylight hours, the group will be hosting a "Hangover Recovery" pop-up station complete with a wide variety of hydration solutions and soothing "retro" King's Heralds tracks. The General Conference Youth Department has agreed to invest substantial funds to cover attendance (general admission tickets this year cost $375 per person), hydration product expenses and the manufacture of said glow sticks. Pujic said that the motive behind this evangelistic effort was an effort to "get real about evangelism and actually go to where younger people are." She said that previous efforts by the church have been particularly unsuccessful in impacting youth culture because they rely on outdated approaches such as handing out tracts to the public which, "in today's culture is received about as well as online Viagra spamming." Regardless of whether the 100 GYC students have any redeeming, salvific impact on the 500,000 swaying, staggering, glassy-eyed attendees, one thing is for sure: it’s a good excuse to go and catch an awesome concert, especially with the GC footing the $375-per-person ticket. After Coachella, the GYC should plan to evangelize all the major Spring Break events in Baja and Florida, and maybe some Metallica concerts. Next stop: The Burning Man festival. Converts will get the opportunity to add their evil books, cassettes, CDs, DVDs, VHS tapes to a special bonfire. The next newfangled GYC evangelism project will place young adults in the marijuana-smoking clubs and “pot bars” of Colorado. They will be equipped with GC-issued flashlights so they can see their way through the thick haze of weed smoke. Each participant will hand out Vege-Burgers to the pot smokers throughout a two-hour shift. The GC participants will be instructed not to inhale. What??? GYC will tell the volunteers to hold their breath for the entire two hours? Is this for real? Can’t the GC afford to buy gas masks? Will GYC come up to Woodstock here in NY this summer? Great opportunity for evangelism. Drop in. Drop out. A real cool place to be in 2015. I am willing to put a couple of GYC’ers in my home for a few days. Radical, Dude!! Woe is me. They will attend only if the Heritage Singers and the King’s Heralds are invited to sing. For the very radical SDAs the after show will feature that way-out group called The Wedgewood Trio. They had DRUMS and GUITARS! This event already happened tomorrow. Wait, I mean, it will happen yesterday.